Windows XP crashes out of Olympics? Microsoft's Silverlight browser plug in might be in contention for PR gold for its streaming of Olympics 2008 content online, but Windows is letting Team Redmond down badly. 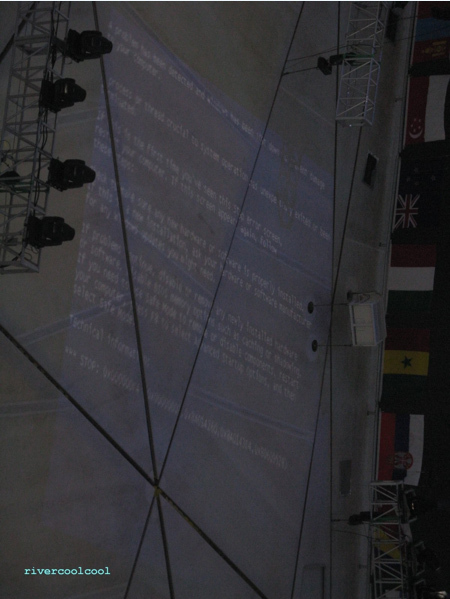 The global audience tuned into Beijing's National Stadium got to see Microsoft's dirty laundry aired in public during the opening festivities: the Blue Screen of Death on massive Olympian-sized monitors, as systems tasked with running the coordinated visual spectacle and reportedly powered by Windows XP Embedded apparently crashed. Those viewers include, of course, Bill Gates. One sharp-eyed observer caught and posted the pictures (below) to his blog here. Blue Screen of Death takes Olympic podium? Windows was out for about an hour, just enough time for the athlete carrying the Olympic flame to be caught by the eyes of the world passing in front of the screen en-route to lighting the main stadium torch.